Four years ago, I wrote a piece for Forbes called “This New Libor ‘Scandal’ Will Cause A Terrifying Financial Crisis,” in which I explained that the “real” Libor scandal wasn’t the Libor rigging scandal, but the fact that that Libor interest rates were simply too low for too long, which was helping to fuel dangerous economic bubbles around the world. I was frustrated that, despite all the attention the Libor rigging scandal had received, that almost nobody was paying attention to the even larger crisis that was looming. It’s not that I was trying to minimize or trivialize the Libor rigging scandal; it’s just that I believed that the mainstream financial world was missing the forest for the trees. As I explained, the Libor rigging scandal caused tens of billions of dollars worth of losses, but the eventual popping of global bubbles that formed as a result of ultra-low Libor rates would gut the global economy by trillions of dollars. I still firmly believe that. As the world’s most important benchmark interest rate, approximately $10 trillion worth of loans and $350 trillion worth of derivatives use the Libor as a reference rate. Libor-based corporate loans are very prevalent in emerging economies, which is helping to inflate the emerging markets bubble that I am warning about. In Asia, for example, Libor is used as the reference rate for nearly two-thirds of all large-scale corporate borrowings. Considering this fact, it is no surprise that credit and asset bubbles are ballooning throughout Asia, as my report on Southeast Asia’s bubble has shown. 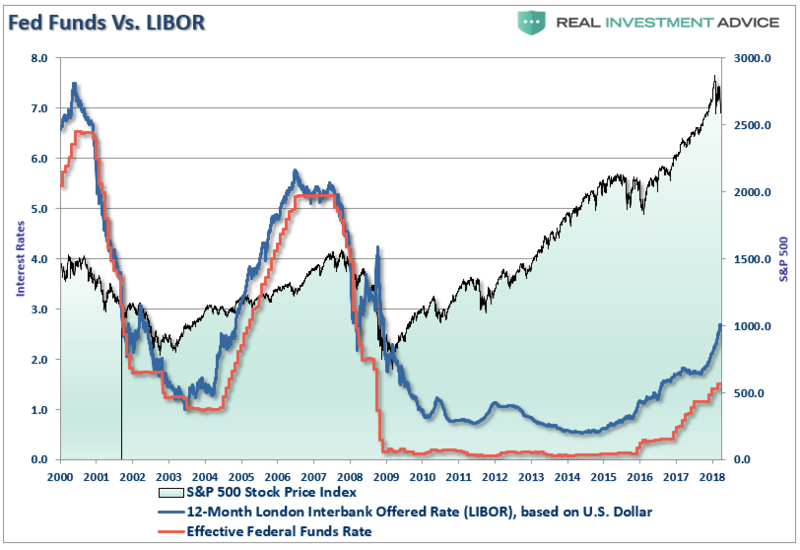 Like other benchmark interest rates, when the Libor is low, it means that loans are inexpensive, and vice versa. As with the U.S. Fed Funds Rate, Libor rates were cut to record low levels during the 2008-2009 financial crisis in order to encourage more borrowing and concomitant economic growth. Unfortunately, economic booms that are created via central bank manipulation of borrowing costs are typically temporary bubble booms rather than sustainable, organic economic booms. When central banks raise borrowing costs as an economic cycle matures, the growth-driving bubbles pop, leading to a bear market, financial crisis, and recession. The chart I created in my original Forbes piece shows how historic bubbles formed during periods of low Libor rates (also, low Fed Funds Rates, as the two are highly correlated). What is particularly concerning is the fact that Libor rates have remained at record low levels for a record length of time, which I believe is helping to inflate a global bubble that is more extreme and potentially ruinous than humanity has ever experienced (I’ve named this bubble “The Everything Bubble”). Similar to the U.S. Fed Funds Rate, the Libor has been rising for the last several years as central banks raise interest rates. While rising interest rates haven’t popped the major global bubbles just yet, it’s just a matter of time before they start to bite. While most economists and financial journalists view the rising Libor as part of a normal business cycle, I’m quite alarmed due to my awareness of just how much our global economic recovery and boom is predicated on ultra-low interest rates. 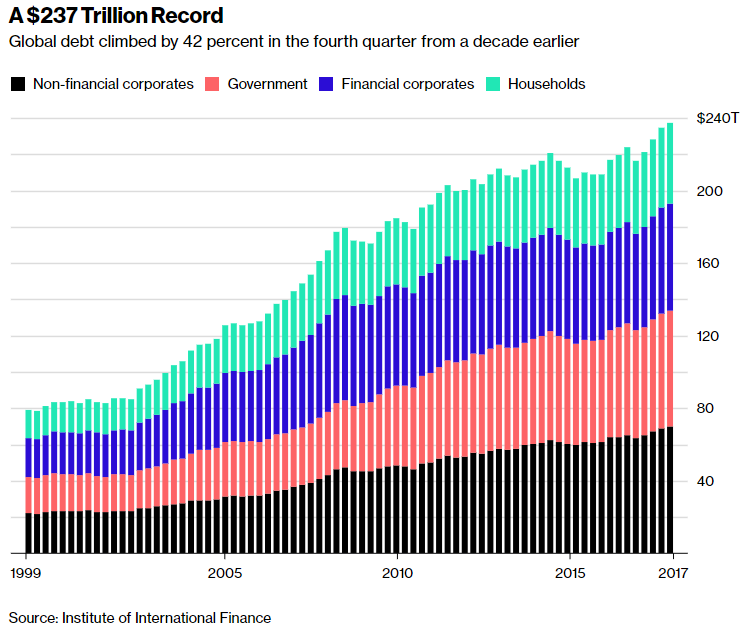 With global debt up 42 percent or over $70 trillion since the Global Financial Crisis, interest rates do not need to rise nearly as high as they were in 2007 and 2008 to cause a massive crisis. Though I am obviously concerned about rising Libor and Fed Funds Rates, I am a realist and pragmatist when it comes to investing and trading; I’m not a “permabear.” As I showed last week, most U.S. stock indices are still in an uptrend despite the volatility of the past several months. This is a time to be a nimble trader with a finger on the “sell” button if and when the primary trend breaks down in a serious way.